Here’s something you might have started noticing yesterday on your favourite IM platform, WhatsApp, those two delivery ticks turning blue. As some have figured already, WhatsApp has introduced this as a way to check if the message you send has been read. The ticks turn from grey to blue once the message has been read and for messages on group chats, they turn blue when everyone on the group has read your text. This new update follows other changes made to the IM platform this year since it was acquired by Facebook like the option for hiding your “Last Seen” notification and extended privacy settings for profile pictures and statuses. The message read update is supposed to work on almost every version of WhatsApp so there should be no need to upgrade to the latest version if you want to monitor your own messages. What are your thoughts on this new change to WhatsApp? Are you comfortable with this update? Feel free to comment below. its now easy to know those who care for you and those who dont….so unfortunate if you have been pursuing that girl you thought likes you but only to know that she reads your messages after an hour of delivery!! True that, today I sent a message to my niece and she replied but the tick is still grey. Possible bug or just misunderstanding of the new system. Imagine if I were “pursuing” a girl, and not talking to a relative. The recipient may be using an outdated version of WhatsApp. I think this is a good development for those who lie that they havent read your chat! crap…. I need time to consider my responses, I need the choice to read and not respond… can this feature be turned off. I respond to 10%… now the 90% are going to know I am ignoring them! Hey guys i have a Powertel EVDO 3g modem and an Africom sim card but failing to connect to the internet on managing to check etc. Do i need to visit Africom offices with my Powertel modem and device or you can give me some ideas. I was of the opinion that Africom sim cards only work on their dongles, and Powertel require their sim cards to work on their modems. Take your dongle to Africom they will put their settings and it works perfectly well. what does it mean for privacy?? look guys I always knew you were retarded I just didn’t know you were fully retarded, tell me, what does knowing that your message has been read have to do with privacy, whose privacy is being invaded by that? what does this have to do with privacy???? Whether ticks turn blue or pink to show that yo message has been read or not, its neither here nor there. Whether one ignores people or not, s/he cannot be manipulated to impress people by immediately responding to sent messages. Your claim that Whatsapp is trying to avoid upsetting carriers is baseless and not factual and shows that you don’t read financial reports of carriers such as a econet. The trend worlwide is that while carriers are seeing drops from voice and text revenue they are also realising high revenue through data. Most people from India, China up to Zimbabwe access the internet only through their mobiles meaning that these carriers have become ISPs. These carriers have noticed the shift in people’s ways of communicating and are now huge investors in the broadband and wifi industry eg Econet with Liquid Telecom and Telone with adsl. They will lose nothing when whatsapp enters the VOIP segment because for them the more you talk on whatsapp the more the data you chew from them. Sorry to reply this late. But considering how whatsapps compress their data, surely if they can manage to introduce voice over internet on whatsapps , many telecoms company will collapse. 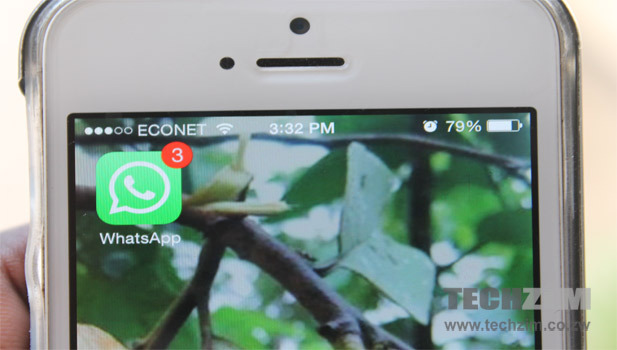 Your claim that whatsapp is trying to avoid upsetting carriers is baseless and not factual and shows that you don’t read financial reports of carriers such as a econet. The trend worlwide is that while carriers are seeing drops from voice and text revenue they are also realising high revenue through data. Most people from India, China up to Zimbabwe access the internet only through their mobiles meaning that these carriers have become ISPs. These carriers have noticed the shift in people’s ways of communicating and are now huge investors in the broadband and wifi industry eg econet with liquid and telone with adsl. They will lose nothing when whatsapp enters the VOIP segment because for them the more you talk on whatsapp the more the data you chew from them. Maiwe inga ndakuzobatwa zvino! whatsapp yangu yakaita kuzara ne ma unread messages anobva kuvanhu vane manic depression vanoswera vachitumudzira mazi message anozadza page yese vondiudza kuti ‘pass the message to 10 people’ kuti uwane makomborero nekuzopedza vachiti ‘and pass the message back to me’! Nguva nepfungwa dzekutambisa ndozvandisina manje. what one chooses to do with their mail is private read or not ,im sure delivery is what we should be worried about!!! !guys get a life. Is this available for watsapp plus.